The hrSource Center is your primary resource for information, transactions and services related to your retiree benefits, which include healthcare, and depending on your plan, dental, life insurance, savings, pension and stock awards. You can reach the hrSource Center by phone (toll-free) or online. Be sure your personal information is correctly listed with the hrSource Center. It’s important to keep your mailing and email address up-to-date so you continue to receive information about your Pfizer benefits. If you are eligible for retiree life insurance, confirm your beneficiary data is current and accurate; and if you receive a pension benefits from Pfizer, be sure to also provide new or updated direct deposit information for your bank. If you need to update your information, call the hrSource Center at 1-866-476-8723. To reach the hrSource Center by phone, call 1-866-476-8723. The hrSource Center specialists are available Monday through Friday from 8:00 a.m. to 6:00 p.m., Eastern time. Change of Address You will need to call the hrSource Center at 1-866-476-8723 to change your address. At the medical, dental, life insurance and billing prompt, you will be connected to a benefits specialist who will help you make this change. When you call the hrSource Center at 1-866-476-8723, you will be asked if you are an active colleague or presently on a leave of absence and you will need to respond "Yes or No." Respond "No." You will then be asked if you are a Retiree, Survivor, Alternate Payee or Former Colleague. Respond "Yes." You will then be directed to 6 menu options. Each option corresponds to a different type of benefit or service. You will be asked to press or say the number which corresponds to the appropriate benefit or service for which you have a question or need help. If you forget or lose your PIN, you can change it from the IVR menu. Just select the menu prompt for the type of benefit or inquiry (from the options above) and then follow the prompts on the voice menu to change your Fidelity PIN. Obtain information about your medical, dental (if eligible), savings plan and pension. Obtain medical coverage forms such as claims forms and HIPAA authorization forms (HIPAA forms are necessary if you want to designate someone to access to your medical records). Make beneficiary changes to your savings and pension plan. 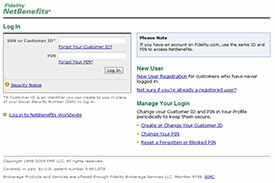 You will need your Social Security number and Fidelity PIN (6-12 digits) to log in to the site. If you are using the hrSource Center online for the first time, you will need to register first. If you forget your password or PIN, simply follow the prompts on the screen or call the toll-free 800 number provided online for assistance in re-setting your PIN.